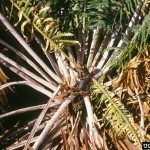 My Sago palms were hit hard by the numerous freezes in Houston this past winter and many of the fronds were left all dead or half dead (half green). Two seem to be coming out of it pretty well, but the third looked like it had a bad haircut after removing the damaged fronds. It looked like it had new growth sprouting from the top, so I trimmed the remainder of the fronds off. It's been about a week and this has not stimulated any growth like I thought it would. What do you recommend that I do? Wait or replace? It will likely only grow new fronds from the top. If this is not the look that you would like, it would be best to replace it.